Neighbors around South Graham Street will have new pavement this week, but first, they’ll have to deal with a few traffic complications. The Seattle Department of Transportation plans to grind and pave South Graham Street between Swift Avenue South and 23rd Avenue South this Thursday and Friday, August 29 and 30, weather permitting. During the work, the street will be closed to eastbound traffic, and drivers will be directed to continue south on Swift to Beacon Avenue South. Work hours will be 8 a.m. to 6 p.m. Pedestrian traffic will not be affected, and police officers will be on hand to keep vehicle traffic moving. The full width of the street is to be repaved, with one lane left open in each direction for street traffic. There will be a police officer on site to assist navigation through the construction area. Pedestrian paths will remain open. If the forecast calls for rain, the project may be rescheduled. The Jose Rizal Bridge. Photo by Seattle Daily Photo in the Beacon Hill Blog photo pool on Flickr. 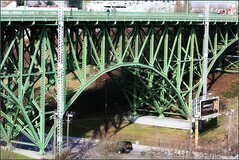 Seattle Department of Transportation crews will repair the underside of the Jose Rizal Bridge (the 12th Ave. S. Bridge) from August 1 to August 26. They will close the northbound, right lane across the bridge from 8 a.m. to 3 p.m. during this time. The sidewalk will remain open. Please be aware that there may be some traffic congestion. The Seattle Department of Transportation (SDOT) reports that they have temporarily closed the public stairway that runs between 18th Avenue South and 20th Avenue South at South Lucile Street, through the greenbelt east of Cleveland High School. During the next two months, SDOT crews will rebuild a lower portion of the stairway which does not meet current standards. A pedestrian detour is in place. The Seattle Department of Transportation (SDOT) sent us an announcement about turning restrictions on Columbian Way to improve safety during the Columbian Way Paving Project. On the section of Columbian Way which stretches from 15th Avenue South to Beacon Avenue South, left turns are being restricted. Drivers traveling eastbound on Columbian Way are currently not able to make a left turn between 16th Avenue South and the V.A. Hospital, although left turns onto 16th Avenue South will be permitted. This means no left turns from eastbound Columbian Way into or out of Mercer Middle School until the end of the project, expected to be the first week of October, weather permitting. A contractor working for SDOT is rebuilding major portions of South Columbian Way between Beacon Avenue South and 15th Avenue South during the next two weeks, weather permitting. One lane will remain open in each direction; however, flaggers may hold up traffic periodically for trucks entering and leaving the work zone. The traffic will be shifted from one side of the road to another several times during the next two weeks as the road is rebuilt and paved in sections. View Columbian Way Paving Project Turn Restrictions in a larger map. The restricted area is marked here in orange. Resurfacing the asphalt pavement on 15th between Beacon Avenue South and South McClellan Street. Installing new curb bulbs and ramps at 15th and South Lander Street. Adding sidewalk improvements at Beacon and McClellan. Adding two new marked crosswalks at 15th and Lander. Installing pedestrian warning signs at 15th and McClellan. Retrofitting existing ADA ramps with tactile (detectable) warning pads. Adding new bike facilities between College and Spokane. SDOT will be removing parking from one side of the street in each block, using alternate-side-of-the-street parking as a traffic calming technique. Additionally, there will be a much-needed right-turn-only lane at the intersection of 15th Avenue South and South Spokane Street, when going southbound. You can read more about the rechannelization here. Work on the project is scheduled to begin in mid-July and continue through September. You should expect lane closures, pedestrian detours, parking and loading restrictions, and the usual construction noise and mess. More information about specifics will be coming soon. 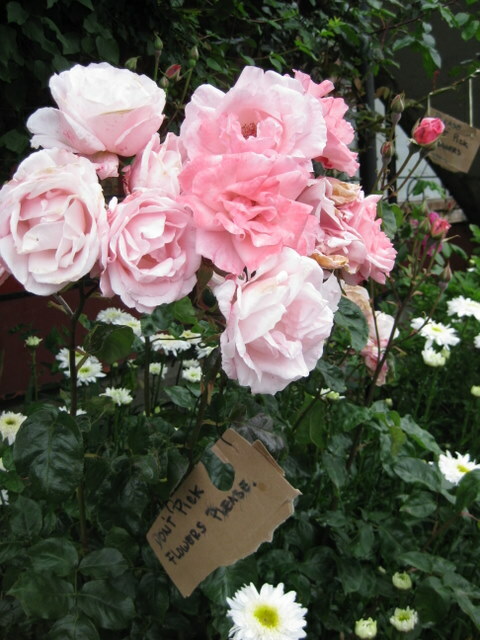 Look, but don't pick. Photo by Joel Lee. 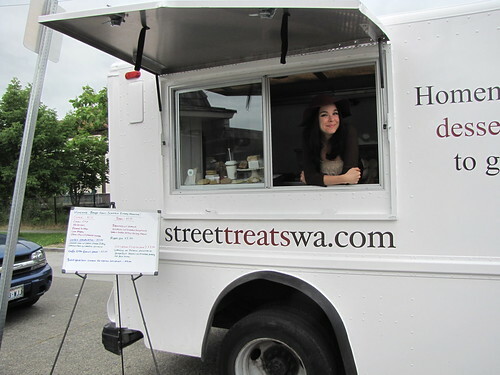 The Street Treats van visited the intersection of Beacon, Lander, and 16th on Friday night, bringing ice cream and baked goods. Photo by Wendi. Workers from SDOT work on the pavement at Beacon and Forest, where a new crosswalk with flashing lights will be installed later this summer. Photo by Jason. This Saturday, Seattle Department of Transportation (SDOT) paving crews will be working at 17th Avenue South and South Forest Street, near the Beacon Hill Library. Traffic in both directions on 17th will take turns sharing one lane with the assistance of traffic flaggers. Anticipated work hours for the project are 9:00 am to 6:00 pm. Update, 6/25: SDOT tells us the reason for the paving work is to prepare for pedestrian activated crosswalk lights that will be installed in the crosswalk later this summer. The lights will flash when a pedestrian activates the lights prior to crossing the street. Funding for the project comes from the Neighborhood Project Fund and the Bridging the Gap transportation initiative approved by Seattle voters.